Many people choose to wash their cars by hand or with a hose, but there are advantages to be had by using a pressure washer instead. Not only is it far less manual effort than washing by hand, but it also uses less water than a traditional, unpressurised hose. People often question whether washing a car with a pressure washer can damage the vehicle’s paint. Though this is possible if proper care is not taken, it doesn’t have to be the case. Below, we’ll look at how a washer can be used without any risk to your car’s paintwork. Now that you know the best pressure washer to choose, as well as the advice to follow to avoid damage, here’s our quick guide to safely cleaning your vehicle with a pressure washer. Using one of your broader spray nozzles, you’ll first want to remove the top layer of dirt. Avoid a powerful spray or a focused nozzle whilst dirt remains on the paintwork, and be especially careful with delicate areas such as headlights. Again, using a weak and broad spray pattern, apply a detergent or foaming car soap. You can use your pressure washer to do so, if it has a feature that allows this. Only allow the detergent to sit for a few moments, otherwise you can be left with streaking. Next, you’ll want to focus on removing any dirt and grime that wasn’t removed on the first pass. If your pressure washer supports a variety of attachments, you could use a brush nozzle. That said, do not use your brush on the wheels prior to the rest of the car, otherwise you risk transferring abrasive debris from the wheel arches onto the paintwork, causing scratches. At this point, you can switch to a high-pressure spray pattern and nozzle. Any remaining dirt should now have been loosened and will be easily washed away by the strong jet of water. To avoid risking any damage from the higher-pressure setting, you should maintain a safe distance from the car; approximately 1-1.5 meters between the nozzle and paintwork is ideal. By following all the advice and steps laid out above, you can safely enjoy the time-saving benefits of pressure washing your vehicle, without any of the concerns that you had regarding paintwork damage. 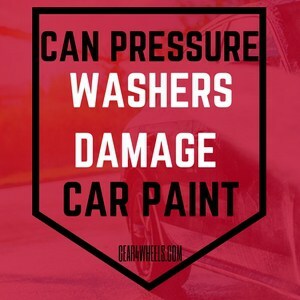 Car Pressure Washers Damage Car Paint?